The fact that the 1993 raid on the Waco compound of Branch Davidians bears no apparent relevance to 2018 Australia did not prevent me from powering through half of its six episodes. As a story it sucked me in. How could so many people follow such an extreme religious leader? And how did circumstances intensify to such a state that a bloody siege unfolded, ultimately leading to 76 deaths? And what lessons has history taught? Paramount’s 6 part series is written by John Erick Dowdle (also director) & Drew Dowdle whose horror / thriller films have included Quarantine, Devil and No Escape. They now take an assured step into the miniseries genre, dramatising the 1993 siege. The script is based on 2 biographies of key participants and this brings considerable plausibility to the drama. 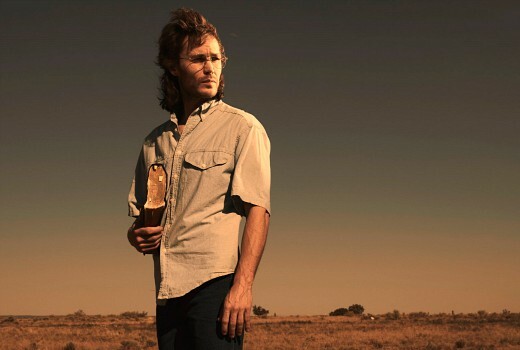 Taylor Kitsch is fittingly enigmatic as sect leader David Koresh, mesmerising a community of dozens of men, women & children with his Biblical insight, all under the roof of an isolated ranch in Texas. While they trade in firearms at local gun shows, Koresh’s disciples also pray together and follow such zealot teachings as celibacy and polygamy. Elsewhere, FBI Crisis Negotiator Gary Noesner (Michael Shannon) is summoned to a stand-off in Idaho which is mishandled by agent Mitch Decker (Shea Whigham) and leads to a P.R. disaster. When politics threatens FBI funding, the top brass look to Waco for a win: there are rumours of child abuse, and enough firepower being assembled to mount a small war. Meanwhile Koresh has recruited young local David Thibodeau (Rory Culkin) into his flock who slowly succumbs to his doctrine, concurrent with ATF (Alcohol, Tobacco, Firearms) agent John Leguizamo (Jacob Vazquez) infiltrating the compound and befriending Koresh. Told from perspectives both within and without the compound, the work is surprisingly sympathetic to Koresh, which may be its biggest weakness given the fatal outcome. Yet if we are to appreciate how so many followers fell under his spell then there is some logic at play. Chameleon actor Taylor Kitsch, complete with ’80s hair, delivers a compelling and colourful performance, artfully contrasted by the dependable and grounded Michael Shannon (is there anything this guy can’t do?). John Leguizamo is suitably conflicted as an ATF agent, and what a joy it is to find Julia Garner (Ozark, Maniac, The Americans) as one of Koresh’s many female devotees. The drama draws upon real news footage in carefully-showcased moments but little will prepare you for the bloodbath when ATF stage an assault on the compound. Ugly stuff. Waco is knee-deep in power, faith, state and consequence, marked by some riveting performances. Looking at recent events much closer to home, there may be a relevance after all. Waco screens in double episodes 8:30pm Thursdays on SBS. I remember the late Bob Ellis talking about this event in the 1990s when he had a radio show on Radio National-the Koresh ‘Branch Davidians’ were an offshoot of the 7th Day Adventists that he had been in when he was young in the 1960s and documented in the film ‘The Nostradamus Kid’ so the events of Waco had a direct connection to us here in Oz.